DESCRIPTION: Saunders and Duff make an effective presentation team. These former soldiers bring to the story an eye for the land that is as important today as it has always been in land warfare. In presenting the story of the Battle of Hastings, they are covering a subject that is so well known as an event but so little known and understood as a military campaign that created the basis of England. 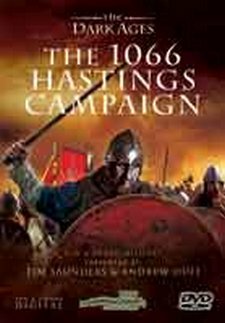 The story includes The Battles of Fulford and Stamford Bridge that played a critical part in the Norman victory at Hastings that was much closer that Norman accounts suggested. These events were the result of a lack of clear succession to the English crown and a nation that was still developing from a collection of warring tribes. When Harold became King of the Saxons, he faced competition from Norway and Normandy. This meant that he faced invasion at both ends of his new kingdom and only one army to face both attackers. That he managed to march his army North to defeat the Norwegian threat and then turn round, march back South and fight an even larger invasion force under the Duke of Normandy says much for his leadership and for the stamina of his troops. All the more remarkable because only a small core of professional warriors formed a key part of an army predominately of thirdsmen who were farmer militia provided by the Hundreds, or counties, in time of war. That he came close to victory against the Normans makes him one of histories outstanding military leaders. Of course the Norman victory largely removed accounts of Harold’s achievements because the victors wrote the history and needed to present the Norman campaign in the strongest light as they attempted to spread out through England and destroy all remaining pockets of resistance. Today, even though most British schools consider British history as a low priority, the one date and event that most Britons can recall is the Battle of Hastings in 1066, even if many have no real idea about the detail or the full significance. The presenters offer a very credible account of the set of battles and cover Hastings in detail, examining the turning points and explaining why Harold lost. The presentation is colourful and lively, including vignettes provided by leading living historians. This is an engaging and absorbing DVD that moves at a reasonable pace, covers the subject well, adds the soldier’s eye and provides the feel of authenticity. This is a story that should widely circulate and do much to address a lack of history teaching. It highlights why history is so important to the present. For Britons to prosper in the world they need to know who they are and to be confident in their identity. Understanding the events that formed England and led to the creation of Great Britain is key to developing that confidence. It is also an absorbing human story of courage, determination and will. Excellent.